We need clear, consistent and rigorous standards across the country to ensure all students—regardless of their zip code—graduate with the higher order thinking skills needed for college and careers. The standards reflect the relevant knowledge and skills that young people need to succeed in college and to build and maintain an American workforce that can compete in the global economy. National PTA’s goal is for parents to be knowledgeable about the standards and new assessments and to support them every step of the way as states transition to the standards. 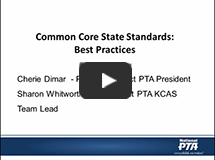 An in depth look at the history of the standards, what is new and improved and an understanding of the key differences between old state standards and the benefits of the Common Core State Standards. An overview of the biggest myths surrounding the standards and information that will help parents separate fact from fiction. A look at the Kentucky PTA 15th district’s work on Common Core, including ideas that any parent or PTA can use in their area. 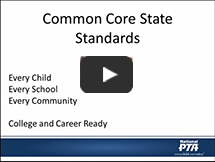 A summary of Common Core resources National PTA has developed for parents.